Prospo 40L Military tactical Backpack Molle Shoulder Bag Rucksack Assault Pack Daypack for Camping trekking Hunting Fishing, good for lots of outdoor activities. The tactical molle shoulder backpack made of 1000D durable polyester fabric, double-stitched, heavy-duty handle and professional compression system. water resistant and scratch resistant. Good companion to carry everywhere. Military tactical backpack is made of 1000D polyester fabric, durable, Wrinkle resistant and shape retention. keeping good shape as new.size: 11"*18"*12"/28*45.5*30CM (W*H*D).Weight:2.82lb. 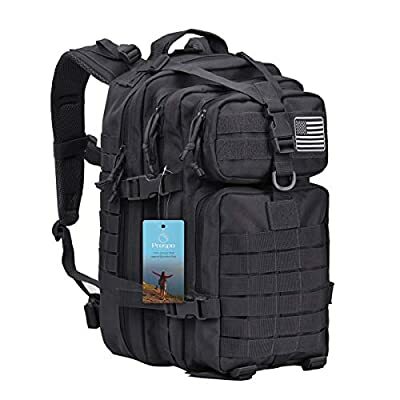 The molle shoulder backpack is armed with several of webbing on the front and side to allow more attachment, 2-way cord zipper, Comfortable padding back area, Ventilated mesh padding shoulder strap., chest strap and waist belt which are detachable, you can remove them, which won't make you feel bulky. The rucksack can be used as a 1-2 day assault back pack, bug out bag backpack, range bag, combat backpack, survival backpack, hunting backpack, military army backpack rucksack or trekking backpack. Come with a flag patch, there is a Velcro place for any patch. The assault backpack also has a hydration compatible which can hold a 2.5l/3l bladder. The strap has a elastic band as a holder to fix the bladder hose. The backpack Daypack is good for women, men, backpackers, hikers, travelers .It is a multipurpose functional backpack.